This is one game that way back in 1997 I was highly anticipating. Having played the previous title in the series, Dark Forces, and having enjoyed it immensely, I couldn\'t wait for the promise of a multiplayer Star Wars first person shooter. This seemed to be basically a multiplayer update for Dark Forces, which disappointingly did not have any type of multiplayer, along with a new engine to power it. Boy was I wrong. It was so much more. You may wonder why I\'m starting with the graphics aspect of the game. Many people have said that graphics don\'t make a game and that it\'s the game play. I wholeheartedly agree with them on this one. The reason is because the graphics in Jedi Knight are actually not one of its stronger points. The graphics work, nothing extremely spectacular. When compared with Quake II, which was released the same year, Quake II clearly wins the graphics arena hands down with its OpenGL accelerated graphics engine. If you are a graphics freak, then you probably won\'t be impressed with the engine used for Jedi Knight, which was designed in-house by Lucasarts. It definitely won?t stand up to today\'s engines like Quake 3 Arena or the Unreal engine. But if you?re looking for game play, read on. That said, let\'s move on the next area. This is where the game really shines. The single-player adventure is one of the most exciting I have yet to play, right up there with Half-Life. The story line is pretty much the same old Star Wars storyline, you know the old: evil-guy-who-wants-ultimate-power-so-he-can-rule-the-universe scenario. But what sets this game apart is the execution of it. The story is executed with such style that one cannot help but gape in awe. One word comes to mind when playing the single player missions: huge. The levels are immense and take quite a while to get through. Even after playing a mission through once, it took me an average of 30-45 minutes to complete each mission. Compare this to the simplistic levels of Quake II and see the rift that divides the two single player scenarios. Another thing to note the rich and varied locations of the single player adventure: Nar Shadaa, Valley of the Jedi, starships, and even Katarn\'s home planet. Another important aspect of the single player game are the amazingly well done FMV cut scenes. Lucasarts has included some of the best quality FMV\'s I have ever seen in a game. The quality is not all, the cut scenes cleverly push the story along with rich characters which creates more depth and emotion that the poorly executed game-rendered cut scenes of Jedi Knight II. Rather than detract from the intensity as the cut scenes in Jedi Knight II do, the cut scenes of Jedi Knight push the story along well, keeping the missions from become routine and repetitive. Couple this with the use of a lightsaber which you get in one of the early missions and force powers which you gain along the way, and you simply got an incredible and engaging single player adventure. Another feature that I like is the ability to choose which path you will go down as you play the game. If you kill civilians and harmless druids, you will begin to go towards the Dark side of the force. If you protect them and do not harm them, then you will lean towards the Light side. There is a different ending depending on which side you choose, so be sure to play it through both ways. The nine other weapons that Katarn will collect along the way are nothing to ignore. This powerful arsenal contains such weapons as the Rail Gun, Concussion Rifle, Imperial Repeater, and more. Now, on to the multiplayer. Jedi Knight shines in multiplayer just like it did in single player. Though the multiplayer modes bring nothing new the genre, the ability to use a lightsaber and force powers makes it a completely different faire that your typical Quake death match. The most fun mode is the sabers only mode. In this mode only sabers can be used and whatever level of force power can be used as set by the host. The creates a game where skill is relied upon more than speed and quick reflexes. Learning to master force powers and the use of the saber is essential to being able to win a saber only match. The multiplayer levels are fun enough, the most famous level for sabers being Battleground Jedi, which is one of the standard saber proving grounds. However, the multiplayer modes lack innovation and more levels would have been appreciated. This is a minor gripe as multitudes of levels can be downloaded from The Massassi Temple (http://www.massassi.net/). The fun factor of playing Jedi Knight online kept me playing it right up until Jedi Knight II was released. Music is the standard John Williams soundtrack, which perfectly accents any Star Wars game because it is the essential Star War music. The sound is adequate, nothing spectacular, but doesn?t detract from game play either. This game was designed to run on the Windows 9x line of operating systems. It is best that you run it on one of the three 9x OS?s; 95,98, or ME. I have had varied results on Windows 2000. On one computer it worked perfectly but on another, which had run it perfectly in Windows 98, I could not get 3D acceleration to work and it was quite choppy in software mode. So the results may vary depending on your configuration. 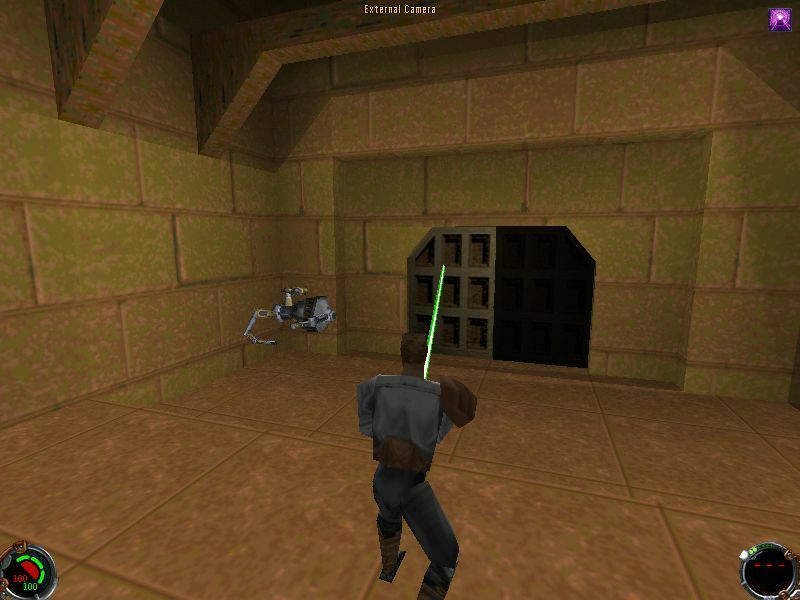 Overall, Jedi Knight is a solid title, though slightly lacking in the area of its graphics engine - which is definitely showing its age, the amount of multiplayer levels included in the game, and the non-innovative multiplayer modes, it shines as one of the best first person shooter of 1997 and beyond. This game will be a classic in its own right. I suggest you go and get your copy at Amazon.com for only $9.99 USD or find a used copy on Ebay.com for even less. You will not be disappointed unless you?re a graphics freak. Oh, I almost forgot, offensive content. This game has no blood, language, or sexual material included. It does have shooting of other characters though from a first person point of view, but none of the deaths are violent or explicit. It is rated T for Teen.